As you enjoy the pleasures of healthy produce from New York State farms, please learn about and take action for the farmworkers whose labor puts beautiful fruits and vegetables on your family’s table. These exclusions leave farmworkers powerless, vulnerable, and ripe for exploitation. Because many NY state farmworkers, including many on small- and medium-sized farms in the Hudson Valley, are Latin American migrants here on visas sponsored by their employers, they are reluctant to ask for better treatment. Concerned about your grocery bill? Don’t be. If the cost of ensuring fair wages and benefits for workers were passed on to consumers, the average household’s grocery bill would increase by about $10 per year. Urge your state Assemblyperson and Senator to co-sponsor and actively support S. 2721/A. 4189, the Farmworkers Fair Labor Practices Act. The bill would establish an 8-hour workday; provide overtime pay of at least time-and-a-half after 8 hours of work; allow one day of rest per week; grant the right to organize & bargain collectively; ensure that housing facilities meet basic standards including structurally safe buildings, clean water, adequate light & ventilation, and facilities for sewage disposal; require employers to provide compensation benefits to injured workers; require supervisors who learn that a farmworker is injured on the job to inform the farm owner; and more. Talk to the farmers at your Farmers Market and CSA: Inquire about their workers and their working and living conditions. Ask farm owners to support S. 2721/A. 4189. Join the Food Justice Working Group of Bronx Climate Justice North. For more info, email: bronxclimatejusticenorth@gmail.com. 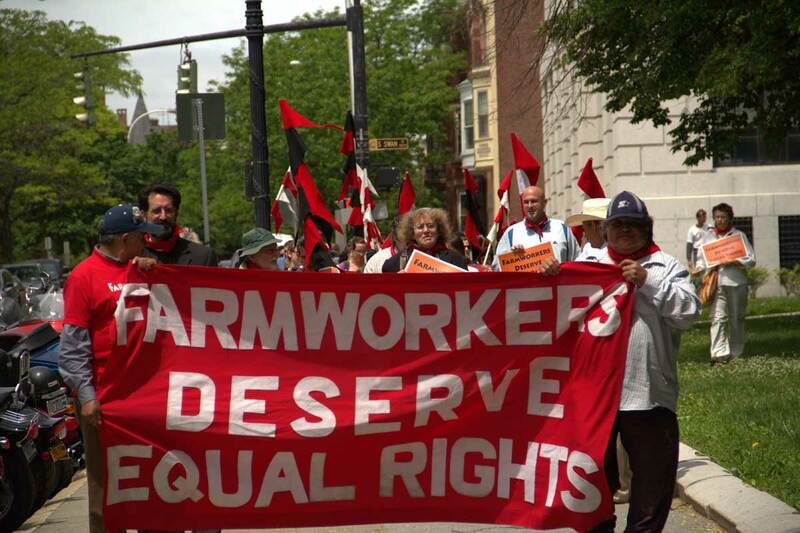 Thank you on behalf of NY farmworkers! Si se puede! See the BCJN post, “The Worm in the Empire Apple” in the Rural & Migrant Ministry blog Witness, 5/25/15, and “Fair Treatment for Farmworkers,” in The Riverdale Press, 6/11/15. For a superb book on the living and working conditions of farmworkers and their families on small- and medium-sized farms in the Hudson Valley, please read Margaret Gray’s 2013 work, Labor and the Locavore: The Making of a Comprehensive Food Ethic. Peace & Disarmament Committee, Local 199, C.A.W. Cayuga/Seneca Community Action Agency Inc.
Economic Justice Program, Hudson Valley Ch. Metro Justice of Rochester Inc.